Got a bad case of Diaper Stink and don't know how to get rid of it? After going around and around with it on my own daughter's diapers a few years back, I can honestly say that this product works. The bottle is just four ounces, but that is enough to completely remove odor from your cloth diapers up to eight times, or use in periodic maintenance up to 16 times. Read on for more information on how easy it is. OdorXit® Concentrate is a strong and yet gentle non-toxic laundry aid that can help you get back to those happy days when your diapers didn't reek immediately when your little one wet, and it doesn't take days of following complicated laundering instructions. It also doesn't require contaminating any of your cooking equipment and gassing yourself out of the kitchen boiling stinky diapers on the stove. You can fix your diaper stink problem overnight right in your washer. Get the product. Follow the instructions below. If your case of diaper stink is really bad, do everything a second time to make sure. Then go back to enjoying your clean-smelling cloth diapers. Don't forget it ever happened, though, because you now hold the key to saving other cloth diapering mamas' sanity by spreading the good word! Add Odorxit® Concentrate to the washing machine at the beginning of the wash cycle with the normal dose of detergent but no bleach. If you have a high-efficiency washer, use two capfulls or one fluid ounce of Odorxit® Concentrate. For standard top-loading washer, use four capfuls or two fluid ounces. Stop your washing machine near the end of the wash cycle and before the wash water empties. Try leaving the door open if you have a top loading washer. For a front loading washer, push the cycle selector knob back in. Allow the load to continue soaking for at least one hour and for as long as overnight with the machine turned off. After soaking, restart the machine and let it finish its normal cycles. If you are sensitive to fragrances, I recommend running an additional wash cycle with half of your usual amount of detergent for the same load size before removing the clean items from the washer. If you choose not to do a second wash, select a wash setting with an additional rinse cycle. 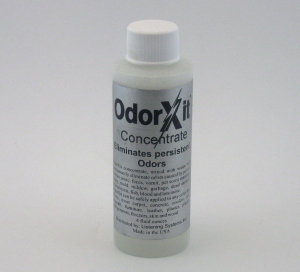 Odorxit® Concentrate works well for removing urine odor, but also many other organic odors including vomit, skunk, spoiled food, fish, mold and mildew odor from machine washable items. It can also be diluted and used for surface cleaning. Click the "Add To Cart" button above. You will be taken to a shopping cart to confirm details of your purchase. Check your email for an email confirming your purchase. We are presently shipping to Canada as well as the U.S.. If you would like to place an order to ship to another country, please send us an email to tell us where. We are happy to research shipping charges and import requirements to make sure we can get your Antsy Pants™ to you before you place your order. Our email address can be found here. More information on international shipping is available on our FAQs page.